The primary function of the scapula is to attach the upper extremity to the thorax and provide a stabilized platform for upper extremity movement. The scapula is attached to the clavicle by the acromioclavicular and coracoclavicular ligaments and articulates with the humerus. The scapula is protected by its surrounding musculature (supraspinatus, infraspinatus, subscapularis) and its ability to move along the wall of the thorax; the body and spine of the scapula are most protected. Fractures to scapular structures typically require significant force. 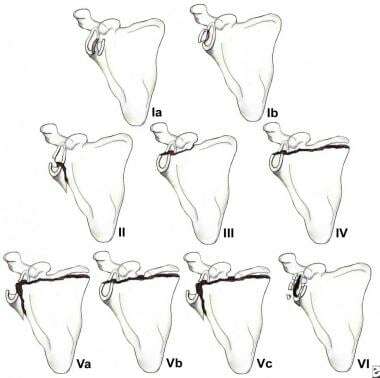 These factors explain the infrequent occurrence of scapular fractures. The primary anatomic features of the scapula provide insight into the mechanisms of injury and offer a convenient classification system. Injuries to the body or the spine of the scapula typically result from a direct blow with significant force, as depicted in the image below, such as from a motor vehicle accident or a fall. 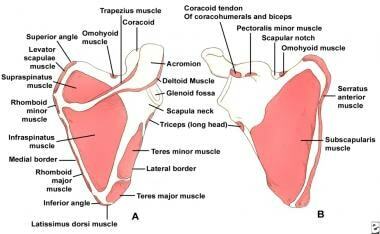 Scapular anatomy. Muscle origin and insertion. Scapular fractures are caused by different mechanisms. Acromion injuries usually result from a direct downward force to the shoulder. Scapular neck fractures most frequently result from an anterior or posterior force applied to the shoulder. Glenoid rim fractures most often result from force transmitted along the humerus after a fall onto a flexed elbow. Stellate glenoid fractures usually follow a direct blow to the lateral shoulder. Finally, coracoid process fractures may result from either a direct blow to the superior aspect of the shoulder or a forceful muscular contraction that causes an avulsion fracture. Classification of these fractures is depicted below. A large force is usually required to fracture the scapula, particularly the body or the spine; however, suspect scapular fractures and thoroughly search for associated injuries. Scapular fractures are more common among men than among women because of their increased incidence of significant blunt trauma. Scapular fractures predominate in persons aged 25-40 years because of the increased occurrence of significant blunt trauma in this population. Bonz J, Tinloy B. Emergency department evaluation and treatment of the shoulder and humerus. Emerg Med Clin North Am. 2015 May. 33 (2):297-310. [Medline]. Audige L, Kellam JF, Lambert S, Madsen JE, Babst R, Andermahr J, et al. The AO Foundation and Orthopaedic Trauma Association (AO/OTA) scapula fracture classification system: focus on body involvement. J Shoulder Elbow Surg. 2013 Sep 27. [Medline]. Audige L, Kellam JF, Lambert S, Madsen JE, Babst R, Andermahr J, et al. The AO Foundation and Orthopaedic Trauma Association (AO/OTA) scapula fracture classification system: focus on body involvement. J Shoulder Elbow Surg. 2014 Feb. 23 (2):189-96. [Medline]. Zlowodzki M, Bhandari M, Zelle BA, Kregor PJ, Cole PA. Treatment of scapula fractures: systematic review of 520 fractures in 22 case series. J Orthop Trauma. 2006 Mar. 20(3):230-3. [Medline]. Cole PA, Freeman G, Dubin JR. Scapula fractures. Curr Rev Musculoskelet Med. 2013 Mar. 6 (1):79-87. [Medline]. Stephens NG, Morgan AS, Corvo P, Bernstein BA. Significance of scapular fracture in the blunt-trauma patient. Ann Emerg Med. 1995 Oct. 26(4):439-42. [Medline]. Baldwin KD, Ohman-Strickland P, Mehta S, Hume E. Scapula fractures: a marker for concomitant injury? A retrospective review of data in the National Trauma Database. J Trauma. 2008 Aug. 65(2):430-5. [Medline]. McAdams TR, Blevins FT, Martin TP, DeCoster TA. The role of plain films and computed tomography in the evaluation of scapular neck fractures. J Orthop Trauma. 2002 Jan. 16(1):7-11. [Medline]. Bartonicek J, Tucek M, Fric V. [Radiographic evaluation of scapula fractures]. Rozhl Chir. 2009 Feb. 88(2):84-8. [Medline]. Bartonicek J, Tucek M, Fric V, Obruba P. Fractures of the scapular neck: diagnosis, classifications and treatment. Int Orthop. 2014 Oct. 38 (10):2163-73. [Medline]. Dienstknecht T, Horst K, Pishnamaz M, Sellei RM, Kobbe P, Berner A. A meta-analysis of operative versus nonoperative treatment in 463 scapular neck fractures. Scand J Surg. 2013 Jun 1. 102(2):69-76. [Medline]. Hart RG, Rittenberry TJ, Uehara DT. Handbook of Orthopaedic Emergencies. Lippincott-Raven; 1999. 149-55. Ohman R, Ridell M. Selective enzyme staining procedures for characterization of mycobacterial immunoprecipitates. Int Arch Allergy Appl Immunol. 1986. 79(2):145-8. [Medline]. Rosen P, Barkin R. Emergency Medicine: Concepts and Clinical Practice. Mosby Year Book; 2002. 584-586. Simon R, Koenigcknecht S. Emergency Orthopedics: The Extremities. Appleton and Lange; 1995. 207-15. Tintinelli J, Ruiz E, Krome R. Emergency Medicine: A Comprehensive Study Guide. McGraw-Hill; 2000. 1784-1787. Veysi VT, Mittal R, Agarwal S, Dosani A, Giannoudis PV. Multiple trauma and scapula fractures: so what?. J Trauma. 2003 Dec. 55(6):1145-7. [Medline]. Superior shoulder suspensory complex. (A) anteroposterior view of the bony/soft tissue ring and the superior and inferior bony struts; and (B) lateral view of the bony/soft tissue ring. Fixation of acromion fractures. (A) tension band construct; and (B) plate-screw fixation (most appropriate for proximal fractures).